Written by	Brenda Linday, L.E., L.E.I., C.A.C. All clients would love to turn back the hands of time. Skin care professionals must manage clients’ expectations with what is realistically possible, combined with superior treatments that will exceed their goals. 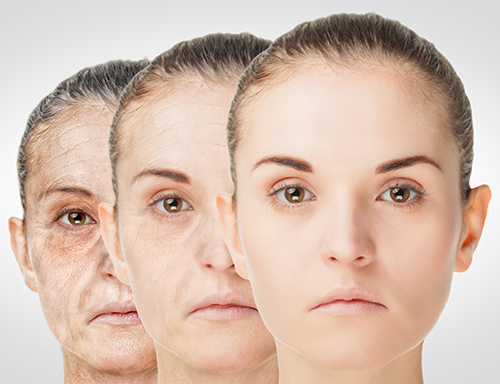 Recent advances in technology and product ingredients, combined with scientific discoveries, have opened a new realm of possibilities in antiaging treatments. These advances offer the professional new tools to provide superior services. However, setting realistic expectations hinges upon the ability to educate clients. It begins with an effective consultation. Professionals should never sell themselves short – their knowledge holds value. Always charge for time, even if it is applied as a credit towards the first treatment. Consultation charges vary by region, averaging $100 for one hour. Schedule 45 to 60 minutes for each consultation and skin analysis. Ask the client to bring in their daily care products and supplements for review (plan to test product pH). Whenever possible, consult in a separate area from the treatment space. Take the time to listen to each client’s concerns. Use a detailed client intake form and become a “skin detective,” asking probing questions if the client is vague; clarify everything and never assume. During the consultation, cover any health concerns that can contraindicate specific ingredients or treatments. Aging clients are prone to more health conditions than young millennials. Even using modalities with electric currents can be contraindicated. Be sure to get a detailed list of medications and supplements to research possible concerns. And, always take time to review the client’s skin care products and home regimen. Acknowledge each client’s goals and assure them of an outstanding treatment program while having an open and honest conversation of what is realistically obtainable. Take before pictures from front and bi-lateral positions. It is imperative to have a starting reference point for the client to see their progress. Photos should be taken at each visit during a treatment program and two to four weeks after its conclusion. Set the camera to the highest resolution setting. Be sure to duplicate settings each time, such as light speed, location, and so forth. Avoid shadows. Take photographs of the client without any makeup or jewelry. Pull the hair back from the face. Next, analyze the skin. Use a magnifiying light, Woods lamp, or a skin analysis machine, if available, in larger centers. Do not forget to feel the skin for textural examination. It is essential to get an accurate assessment of the current condition of the skin. Then, determine skin type and condition. Have an honest discussion on the current state of the skin based on the skin analysis. Next, educate the client on the different factors that contribute to aging skin. Skin loses strength, elasticity, and hydration as it ages. The skin renewal process slows from a 28-day cycle to 37 to 42 days. After age 25 to 30, skin loses collagen at the rate of one to 1.5 percent per year. Most adults will lose 50 percent of their facial collagen by age 60 without treatments and products to stimulate collagen synthesis. A person ages based on intrinsic and extrinsic factors. An example of an intrinsic factor would be if a client’s grandmother had great DNA and looked beautiful at 95, the client may have some of her unique DNA, also. Extrinsic factors include environment and lifestyle choices. Pollution and the ozone layer wreak havoc on skin. Extrinsic factors account for 80 to 85 percent of how an individual ages. Additional physiological changes occur with age. The dermis thins by up to 20 percent. The epidermis thins by 10 to 50 percent. Jowls become prominent as bone density thins and fat pads shift. Pigmentation becomes more prominent. Decreased lipid and hyaluronic acid production causes dryness and dehydration. Reduced collagen and elastin production causes structural weakening. Neck tissue loses elasticity, causing it to sag. Matrix metalloproteinases enzymes (MMPs) weaken the extra cellular matrix. Normally, the body metabolizes carbohydrates into sugars, like fructose and glucose, which provide the fuel, or energy, for the body. Glycation is a destructive biological reaction that takes place when fructose or glucose becomes attached to DNA, proteins, or lipids without enzyme activity. These molecules then form advanced glycation end products(AGEs). Individuals consuming a diet high in sugar or high-glycemic foods, and diabetics, develop AGEs. Elevated AGEs levels accelerate aging. A report published in The British Journal of Dermatology stated that glycated skin increases after age 35 and accelerates when exposed to ultraviolet rays. AGEs degrade the normal, healthy, functions of the skin. Glycation leads to cross-linking of collagen and elastin fibers, which destroy dermal support. Skin loses its elasticity and becomes tough, bumpy, and wrinkled. AGEs repel moisture, leading to dry, cracked skin. Inflammation occurs as the skin struggles to fight glycation. This destructive cycle is relentless. Inflammation leads to redness and irritation, which causes more glycation. Lifestyle changes can help fight glycation. For instance, clients can cut down on carbohydrates, look into a low glycemic diet, and eat every four hours. They can also switch from fried and barbequed crispy foods to softer exteriors. Eating blackened or crispy foods add to the AGEs already in one’s body. Cooking foods slowly on low heat is ideal. Protection from ultraviolet rays and HEV light is also important. Clients should maintain a healthy weight; thick waistlines can increase AGEs. Lifting weights is good, as muscle tone lessens with age. A lower muscle mass can elevate blood sugar, leading to increased AGEs. Researchers have found that alcohol enhances glycation, so drinking less alcohol is also a good idea. Clients should also increase the antioxidants they eat, consuming more fruits, vegetables, dark chocolate, and green tea to protect against AGEs. Taking vitamins, such as C, E, B1, and B6, helps inhibit the formation of AGEs. Clients should look for products containing acetyl tetrapeptide 5, superoxide dismutase, glucosamine, soy proteins, genistein, and arginine/lysine polypeptide to fight glycation. This list is not all inclusive. The skin is constantly under oxidative stress impaired performance of cells caused by reactive oxygen species (ROS) and many other free radical sources, leading to cellular oxidation and potentially even cell death (apoptosis). ROS are highly charged oxygen molecules that are especially destructive, leading to premature aging, apoptosis, and cancer. Free radicals damage the skin’s cellular proteins, lipids, and DNA that naturally occur within its own matrix, making the use of antioxidants in diet and skin care products essential. Ultraviolet exposure increases levels of free radicals and depletes the skin’s supply of natural antioxidants. Senescence is the change that occurs after the cell has matured. Normal cells lose the ability to divide through mitosis but remain active and display an increased activity of MMPs that degrade the extracellular matrix (ECM). These cells are linked to progerin, a toxic protein. The accumulation of progerin causes increased DNA damage and contributes to the appearance of aging skin. With each cell division, the tips of the chromosomes (telomeres) shorten. Eventually, the telomeres become too short to replicate; cell division ceases and the cell becomes senescent and eventually die. Telomere shortening can be thought of as a biological clock, as it controls the lifespan of the cells. Telomerase is an enzyme that adds DNA to the end of a telomere actually lengthening it. Exercise stimulates telomerase activity. Clients should aim for 45 minutes three times a week. Look for skin care products with ingredients that stop the shortening and even lengthen telomeres. Progeline™ - trifluoroacetyl tripeptide-2 is a 3-amino acid peptide biomimetic of elafin that modulates progerin, a new senescence marker, for a remodeling effect and reduction of the appearance of wrinkles. Telomeres and cellular senescence are newer areas of research. Professionals should continue to watch for updates in industry journals and at events. Active outdoor lifestyles produce significant ultraviolet damage. 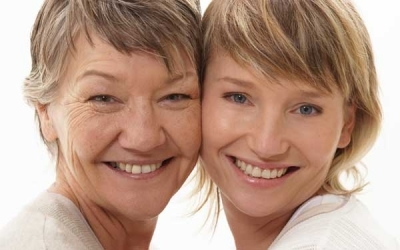 Photoaging not only leads to uneven skin tone, but can lead to skin cancers. Is a client willing to cut back on sun exposure or, at the minimum, wear sunscreen daily and reapply every two hours with outdoor activity? Most individuals do not realize that sunscreens only remain active for two hours and must be reapplied after water activity or heavy perspiration. Regular exercise promotes healthy circulation. The skin needs a healthy blood flow to bring vitamins and nutrients to the cells. If the client does not already participate in an exercise program, encourage them to find an activity that they will enjoy so they will stick with it. Smoking is detrimental to health and skin. Each puff of a cigarette releases over 4,500 chemicals and one hundred trillion free radicals; it also reduces circulation and deprives the skin of oxygen. Hydration is essential, as well. Most individuals have dehydrated skin. The IOM- Institute of Medicine recommends that women get nine cups (72 ounces) of water a day. Those who exercise should add an additional one to two cups. The same holds true for those living in a hot or dry climate. Water can also come from eating water-rich foods, which include watermelon, spinach, cucumbers, green peppers, berries, cauliflower, radishes, and celery. It is important to discuss the client’s current product usage, including expiration time frames. One ingredient that always comes to mind is vitamin C; so many clients realize that it is an integral part of their skin care regimen but use an inferior brand or use products well past their expiration. Liquid forms of vitamin C are often highly unstable and oxidize quickly. When the solution is exposed to air, it begins to oxidize. When vitamin C serums oxidize, they release free radicals, harming the skin. An oil-soluble form of vitamin C (tetrahexyldecyl ascorbate) is extremely stable even when exposed to air or water and has more in-depth penetration abilities. Mature skin concerns require a series of treatments accompanied by a compliant homecare program. Professional treatment plans can provide phenomenal results, but, to maintain and build upon those results, clients need to support them with an equally outstanding homecare regimen. Compliance in homecare is vital. If lack of compliance is suspected, create a written treatment plan signed by both the professional and the client. Be sure that the client will use the recommended products. Substitution of inexpensive daily care can sabotage results. The client needs to understand that shortcuts will not produce results. Be sure to gain the client’s confidence in their treatment plan. Paraphrase the goals, then, discuss what is obtainable and realistic and remind the client that once they achieve the desired results, a maintenance program is mandatory. Three professional treatments should be scheduled every 30 days and, then, the skin should be reassured for progress. 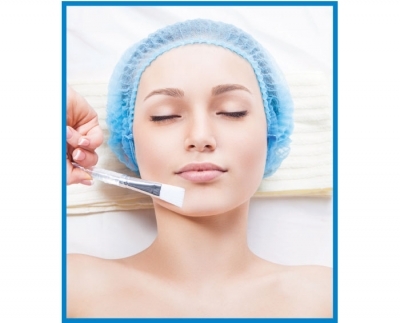 Exfoliation, such as chemical peels or enzymes, can be combined or alternated with microdermabrasion or dermaplaning. 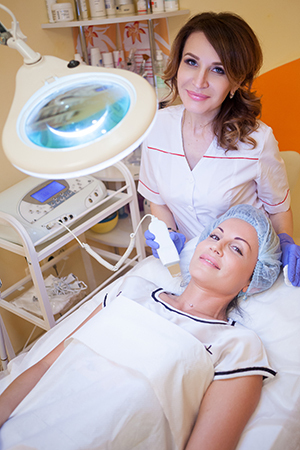 Optional treatments include IPL, LED, hydradermabrasion, and microcurrent. Mature skin requires multiple products to target various concerns. A homecare regimen may include all the following, or specific items to focus on the clients concerns: a cleanser appropriate for the skin type; a vitamin A product, like retinol, retinaldehyde, granactive retinoid, or prescription retinoic acid; a hydration or ceramide serum; a lifting and tightening age renewal serum; a vitamin C serum; a pigment spot treater; an eye cream; a daytime moisturizer; an evening moisturizer, if desired; sunscreen; and a body wash and body lotion. 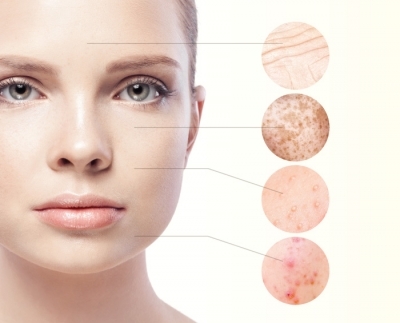 The aging client is often concerned with the increasing number of brown spots on the face and body, along with the inability to get rid of them. An effective skin analysis using a Woods lamp should determine the answer to why the client has brown spots. It is important to know whether the client is dealing with post inflammatory hyperpigmentation (superficial), hormonal pigmentation, including melasma (epidermal or dermal), ultraviolet damage (superficial), or a combination of all three. Both post inflammatory hyperpigmentation and ultraviolet induced hyperpigmentation are superficial and relatively easy to lift. Hormonal pigmentation, such as melasma, can be far more difficult to remedy, and a client may not understand the difference in the depth of the pigment. They client may only see a brown patch and feel that it should be no more difficult to remove than a sunspot. Consider having an educational aid, such as a medical illustration of the layers of the skin, available to explain. Using an educational aid also assists in managing expectations. If melasma is dermal, the professional can show the client that their available treatments cannot reach it. For epidermal pigment, a professional can easily explain how cellular turnover, combined with professional exfoliation and pigment suppressors, will produce results. Melasma is recognized by its larger patches with irregular borders usually presenting on the forehead, cheeks, and jawline. It can reside in the epidermis, the dermis, or a mixture of both. Epidermal melasma can be lifted with exfoliation, suppressing with spot treaters and preventing reoccurrence with sunscreen. Superficial spots can lift within 21 days, while more stubborn epidermal melasma can linger for months. An aesthetician cannot treat dermal melasma, as it is outside the scope of practice. Dermal melasma requires treatment by medical providers using a laser, medium-depth chemical peels, and, often, prescription levels of pigment inhibitors, like hydroquinone, followed by mandatory use of sunscreen. Emphasize that whether melasma is dermal or epidermal, sunscreen is a must. Skin cells have memory; they know that they are damaged and will reproduce melanin immediately if they sense a threat for further injury. The pigment is usually darker and will cover a larger area than the initial lesion. Explain cellular turnover and how it increases with age. The client has to give the treatment and recommended products time to work. The damage (spots) occurred years ago and are just now surfacing. They will not go away overnight. When dealing with melasma, it can take months to see real results and requires a maintenance program. In-depth, effective education gives professionals a better chance of treatment buy-in and homecare compliance and is an essential piece of managing expectations. Many mature female clients have hormonal outbreaks which are very distressing. Outbreaks tend to be nodular or cystic and occur along the jawline. Most women are quite upset to deal with acne for the second time in their lives and want the miracle cure to get rid of it permanently. Explain that the breakouts need to be addressed differently than teenage acne. Hormonal fluctuations in estrogen and testosterone and spikes in the stress hormone cortisol stimulate the sebaceous glands to produce more sebum, which gets trapped under dead cell buildup. Mature skin tends to be dry, not oily. Products that over dry the skin will produce irritation. Treat adult acne with hyaluronic acid and ceramides to help restore the skin’s barrier, balancing hydration levels. Remember that cell turnover slows with age and skin does not desquamate as it does in youth. The dead cells build up and clog pores. Professional exfoliation treatments – supplemented at home with a vitamin A product, like retinol, prescription level retin-A, or renova – will clear pores lessening the chances for breakouts. Use calming, anti-inflammatory ingredients like niacinamide, aloe, and chamomile to assist with irritation. If tolerated, benzoyl peroxide is still the most potent non-prescription ingredient to target the P. acnes bacteria. Salicylic acid is another excellent choice. Another option is to target breakouts with anti-microbial peptides (AMPs). AMPs target the environment that bacteria multiply in, allowing the body to fight off bacterial invasions naturally. Clients should expect slower healing timeframes. Emphasize that due to slower cellular metabolism, a blemish does not heal as quickly as it did at 16. It can take a month for a lesion to heal and another few weeks for any residual redness to fade. Post pimple redness can turn brown after several weeks, resulting in the need to treat the pigmented area after the blemish has healed. Filling up each client’s educational arsenal with superior and current information helps assist in making the best decisions on how to combat their blemishes. Most importantly, ensure that clients understand that purging current congestion followed by blemishes still forming, takes time. It can take 90 days to see clearer skin and, to maintain results, they need to commit to a maintenance program. 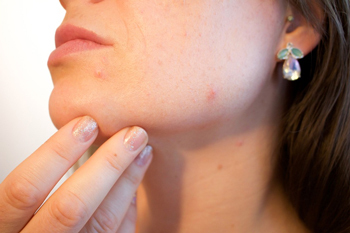 Adults should not hesitate to seek out the advice of a dermatologist if their acne does not improve. Education is vital, turn professional knowledge into the client’s action plan. Be patient with the “know-it-all” client who believes everything they read on the internet. Professionals should use their knowledge base to discount myths and clinical expertise to suggest a treatment plan that will produce results. During treatment, explain the products being used and why they were selected for the procedure. Cover both the features and benefits of the products that are being recommended. Consider limiting both features and benefits to two items each. The client only remembers about 20 percent of what is said – information overload is detrimental. Provide clear application instructions; some products are intended to be used twice a day, while others only once or twice a week. Most product applications are designed to be a thin layer, be sure the client understands that. Many clients have the mindset that if a little bit of a product is good, more must be way better. Often, more is not better and can lead to products being unnecessarily wasted. The skin can only absorb so much; the excess sits on the skin’s surface until it evaporates. Many active ingredients are designed to meet a specific threshold for optimal benefit. Passing the limit on products does not increase results. Many clients fixate on an ingredient thinking that they can purchase less expensive products with the same ingredient at the grocery store. The clinician needs to explain that professional products are formulated to deliver results. Educate clients on reading labels. The grocery store products’ ingredient lists will be primarily water, with a minuscule amount of what should be a results-oriented, key ingredient. Start with education and end with results. Clients are exposed to miracle products daily, giving them unrealistic expectations for treatment results. Education, with an open and honest dialog, leads to a compliant client who has realistic expectationsfor effective professional treatments with quality products that deliver results. 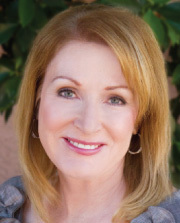 Brenda Linday is a licensed aesthetician, licensed aesthetic instructor, and certified aesthetic consultant with over 12 years of experience in the medical aesthetic industry. She offers consulting services to medical and aesthetic companies desiring to build strong sales and education teams. She also develops educational and engagement-marketing content for employees, contractors, practitioners, and industry distributors around the world. Linday’s passion is to share her wealth of knowledge with other like-minded professionals who believe that education is key to building lasting relationships with clients, making each clinician more successful by increasing client satisfaction. Chemical Peel Intervention: Combined Modalities or Adjunct Treatments?